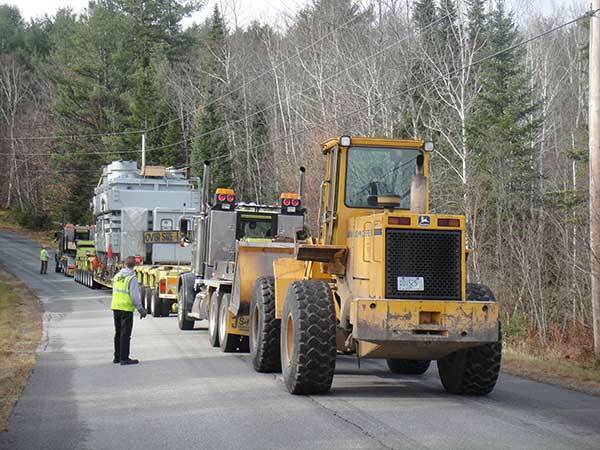 Peak Engineering PLLC provided the structural analysis of several bridges for the transport of a transformer superload to a NH substation for Public Service of New Hampshire. One of the structures along the route required the use of a temporary bridge. Per New Hampshire DOT requirements, Peak Engineering also completed a ground pressure analysis and a traffic control plan for the move. Due to the mountainous terrain, both a prime mover, a push truck, and at some points, a payloader were required to progress the transformer to its destination. The gross weight of the 8 deck 8 transport vehicle was 700,000 pounds.